Girona City with it's spectacular Gothic Cathedral is only 40 minutes draive away and makes an excellent day trip. Families with children will love the Aqua Park in Platja d'Aro (20 minutes by car). Yacht Charter: We have friends who run a sailing school at nearby Port d'Aro and skippered charter of a luxury 50 foot yacht can be arranged. Why not take a day cruise along the wonderful coastline. Fine Dining: Three of the world's best 50 restaurants are in Catalunya within a 40 minute drive. This region of Spain is currently producing some of the most exiting wines in Europe. We can arrange winery tours or reservations in a world class restaurant upon request. There are three bathrooms serving the bedrooms. We have two hot water systems for lots of showers. 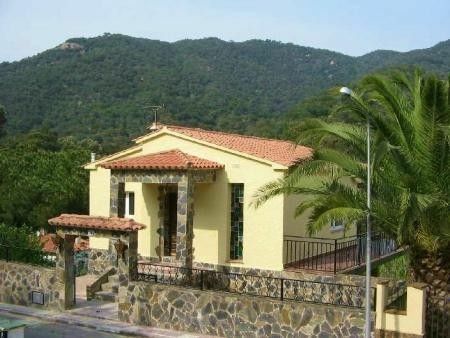 Because the villa is in a coastal area surrounded by hills it is not possible to get high speed broadband. We have a 3g wireless dongle which is suitable for retrieving emails and basic internet. Fully Equiped with modern appliances and lots of counter and storage space. Indoor dining with seats for ten. Picnic benches for lunch around the pool. Tables and chairs on the terrace upstairs. We have a freeview TDT box with approx 40 stations. Mosts dramas originally made in English can be switched to English from Spanish. The villa is on three levels with stairs. Having been extensively refurbished and tastefully furnished in 2006 the villa boasts every modern convenience. Our local English speaking manager will greet you on your arrival and is available to assist you throughout your stay. We stayed in Villa Rosamar in August 2018 and loved every minute of it. The house was really nicely appointed and extremely spacious and easily swallowed up our two families with still room to spare. Lots of lovely balconies off the living space and bedrooms and a fabulous pool in the garden - bigger than most pools in villas. The table tennis was extremely popular with the children too. From a practical perspective, the kitchen was extremely spacious and had all that we needed to feed 11. the washing machine was easy to use, plenty of airers to dry washed clothes and there were plenty of toilets and bathrooms for all. As there was no air conditioning (would be a good addition for the bedrooms) we were quite reliant on the fans. There were not enough working fans when we arrived but when asked we were provided with extra brand new fans immediately which was extremely impressive and gratefully received. There were a few lights without working lightbulbs so perhaps a little more checks needed on handover but otherwise it was really a wonderful house for a family holiday. Rosamar itself is a wonderful oasis and would suit couples and families - more agile elderly. Car essential to get provisions and visit the local area although there is a little shop for necessaries, a lovely restaurant and beach bar all near the beach...the fabulous beach! Thank you for your review. We are really pleased the villa worked for you and your family and that you had a great holiday. We are planning on putting a portable air-conditoner on the bedroom floor for next season and take your point about light bulbs. Once again thanks for such a positive review. We had an amazing time at Villa Rosamar! The villa was a wonderful place to stay after three busy weeks touring other areas in Europe. We loved that the beach was an easy walk down the hill, and that the beach bar served everything from sandwiches to pizza to ice cream. There were days that we didn't even get in the car or leave. Day trips to Barcelona and Girona were well worth it, but we were happy to get back to our quiet cove in Rosamar. Speaking of the cove, I was in awe of the pathway out into the sea- the one I've seen pictures of on Pinterest. It was more beautiful than I imagined. The only issue we had was the heat, that we couldn't control. It was quite warm when we were there. And even with the fans and instructions from the manager in how to best close up/cool off the house, it could get a bit uncomfortable. That's when the pool came in handy. Above all it was an amazing place and we hope to return one day. We were a group of 4 couples with 5 children, who had a lovely one-week stay in Villa Rosamar in June 2016. We found the location to be quite appealing, with its beautiful hillside view and 10-15 minute walk from the beach, as well as good hiking and interesting medieval villages in the area. Rosamar itself is a quiet, very tiny town with a small store, a restaurant, and a beach bar, and we arrived on a Sunday evening with no groceries, so we really appreciated the food items that were provided with the house (bread, pasta, wine, etc.). In general the house was well-equipped with everything we needed, although there were some issues with internet, as the only internet available in the area runs through a sim card. The property manager came to help us sort out the internet, but we ended up having to make a trip to the provider to get it working, and we would have appreciated if the manager had handled this for us. The house is spacious, sleeps up to 12 in beds and has additional baby cots. Four of the bedrooms are close together on the middle floor, sharing one bathroom, with one substantially larger on the bottom floor with another bathroom and separate sitting room. The pool was clean and nice, though fairly cool in late June -- that didn't stop the kids from spending plenty of time in it. We especially enjoyed the barbecue area and ample seating next to the pool. We'd definitely visit again! We had a wonderful relaxing week in Rosamar! The house was very spacious and well maintained with everything we needed. The photos give a very good and accurate impression of this house and its grounds. The local managers were very helpful and available. We especially enjoyed lazing around by the pool and walking down to the picturesque local beach. The beach restaurant is perfect for families with young children: there is an enclosed garden with a playground for the children and a lovely sea view and sangria for the adults - what more could you want?? We greatly enjoyed our stay at Villa Rosamar, which is spacious, private, fully equipped, has nice grounds and pool, and is close to some awesome beaches. Would definitely stay again. Also loved the area, midway in the Costa Brava, reasonably close to both lively towns and medieval villages as well as gorgeous harbors and beaches. We think the area is special and it's nice to share it with appreciative guests. Glad you liked the villa and had a great time. We try to make sure the villa has everything that a family needs to have holiday. It is especially nice to have the beach nearby. Sant Feliu was one of the most important trading ports for corks for the wine industry in the eighteenth and nineteenth centuries and this is evidenced today in the many fine historic buildings. In the 1930's the area became fashionable as a holiday destination and Gaudi designed one of the fabulous art-deco villas that line the promenade at the nearby Sant Pol beach. There are numerous excellent restaurants and bars serving fresh fish and tapas. Only one hour north of Barcelona, Sant Feliu is the perfect base to explore the Costa Brava. We recommend you have travel insurance to cover the eventuality that you need to cancel your holiday as we only give refunds where we re-let the property.